Dell has redesigned the XPS 15 laptop, and it’s available today starting at $1,000 for the base model, and up to $1,700 if you want something with a little more power. Dell has added its edge-to-edge "InfinityEdge" display to the XPS 15, much like the display in its popular XPS 13, and it’s looking extra nice. You’ll have the option of a 1920x1080 resolution or the 3840x2160 4K touch display. Another cutting edge inclusion: a USB 3.1 Type-C port (also compatible with Thunderbolt 3). An added bonus of the narrow bezel is that the 15.6-inch display now fits roughly into the size of an average 14-inch laptop. Its dimensions are 11-17mm x 357mm x 235mm, and it weighs 3.9 lbs for the non-touch, and 4.4lbs for the touch version. 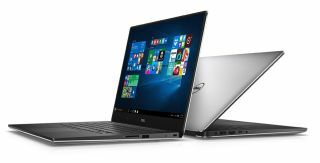 Dell has also upgraded to Skylake processors, letting you choose between the 2.7 GHz Core i3-6100G, the quad-core 3.2 GHz Core i5-6300HQ, and the quad-core 3.5 GHz i7-6700HQ. As for graphics, you’ll be choosing between Intel HD Graphics 530 and an Nvidia GeForce GTX 960M. The latter isn’t the most powerful card out there, but it's capable of good 1080p gaming performance—it's roughly equivalent to a desktop 750 Ti. 8GB DDR4 memory at 2133 MHz comes with most of the options, with 16GB on the most expensive i7 model, but you can upgrade up to 32GB if you want. For storage, you’ve got the options of a 500GB HDD + 32GB Flash, or 1TB HDD + 32GB Flash. Solid State Drives are also available, with 256GB, 512GB, and 1TB PCIe options. Dell claims the XPS 15 should be able to get up to 16 hours of battery life, depending on configuration. Expect to get less than that when you're gaming, of course.